I know the first few frosty weeks of winter isn’t the best time to present late summer cherries, but although I made this in August, my freezer is still loaded with the remains of this same case of now pitted and halved dark BC cherries, and it’s occurring to me that it would make a pretty fab holiday dessert. 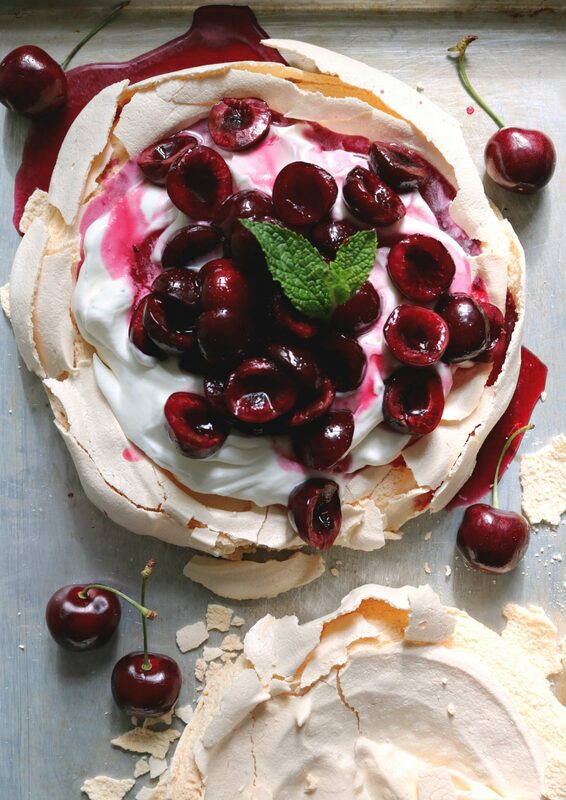 I mean, look at it – the meringue and cream all billowy and snowy, with brilliant red, juicy cherries on top – it could be raspberries or cranberries, or a combination of any or all of the above, you just want berries that are juicy and tart to contrast with the sweet, soft and crunchy cream and meringue. 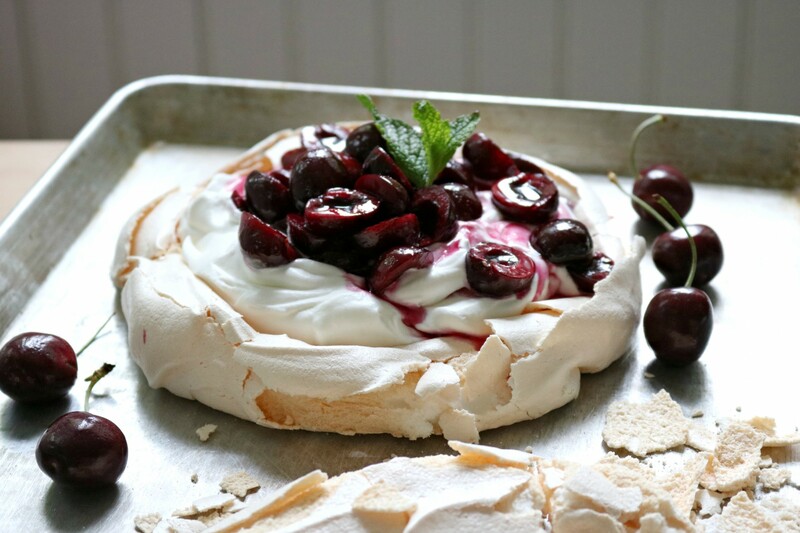 And although these are fresh cherries, tossed with just enough sugar to help them release some of their juices, I typically simmer fruit just briefly enough to start it breaking down, and releasing more juices, then setting it aside to cool (or refrigerate ahead of time) before pouring it over the pavlova. Meringue can crack on the edges, and I’m here to tell you that’s OK. It will still look divine and people will still be more than happy to eat it. Those intimidated by the idea of making meringue can take comfort in the fact that broken meringue layered with the same ingredients as pavlova is its own legit dessert – Eton mess, invented at the boys’ school in Eton, UK, is like a trifle of intentionally broken meringue, seasonal fruit and sweetened cream. If some catastrophe occurs with your meringue, pretend it’s intentional and turn it into Eton mess. 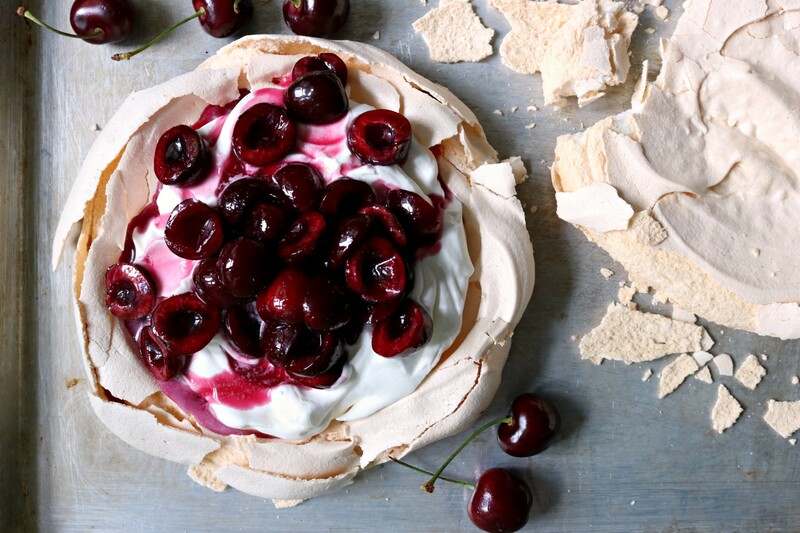 The beauty of both pavlova and Eton mess is that they make the very best vehicles for any fruit in season—use cold stewed rhubarb, fresh berries, pitted cherries or thickly sliced peaches or plums, tossed or warmed with a bit of sugar if you like to help release some of their juices. And the particularly magical thing about making a meringue is that you’ll have exactly enough egg yolks left over to make lemon curd to go with it: whisk 3 yolks, 1/2 cup sugar and the zest and juice of a lemon over medium heat until it bubbles and thickens; stir in 1/4 cup butter, let it sit until it melts and whisk again, then set aside to cool. Keep it in the fridge to eat on cake or scones, or spread a bit in the bottom of your pavlova before adding the cream and fruit. 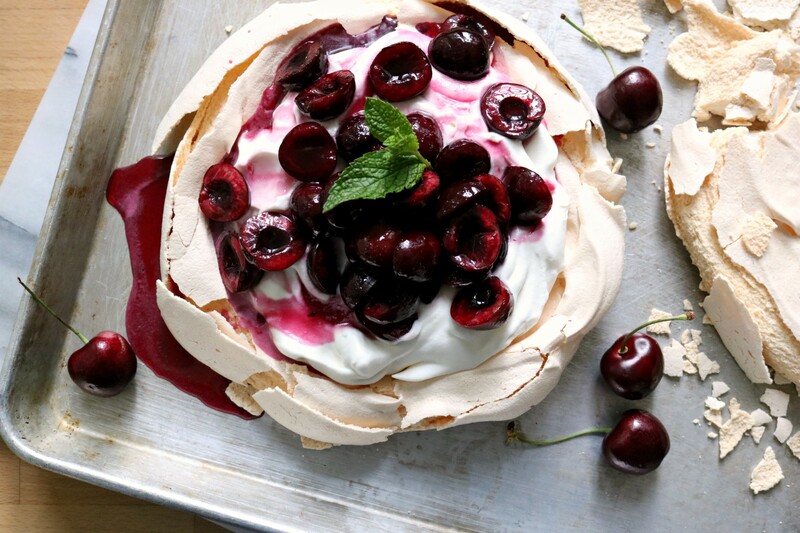 Make one big pavlova to serve in wedges, or more smaller pavlovas for individual servings or two-bite party desserts you can eat with your fingers. Double the quantities to make a large double-layer pavlova or more smaller ones. The bit of vinegar gives the meringue a chewy, marshmallowy interior. that looks delicious,…..and I love the ‘organic’ ( or messy) look…..I will try it. AND if you are looking for suggestions for more posts….I know ‘I’ would love your ideas for a simple, casual, no (big) fuss Christmas open house. I have used some of your recipes from your Grazing cookbook…..but would enjoy any new ideas you have – as you always have some! Thanks – so enjoying your website & look forward to the ‘reno’. Hmmm… that’s a great idea, Faye! Maybe I’ll give it a go! Hi Julie, just finished making the meringue and lemon curd, thanks for demystifying both. Followed both recipes to the letter and I must say I am proud of my first efforts. Thanks so very much. I follow you every day. Love your blog. Aw, thanks Sue!! I love seeing your name pop up here so often. Hi! I just tried to print the recipe and I got a “Page Not Found” error. This looks delicious though! Argh sorry! It should be working now! Thank you! I will definitely be making this soon!